Sarah Palin is viewed unfavorably by nearly 50 percent of Americans, a new CBS News poll finds, a significant challenge for her to overcome should she enter the 2012 presidential race. Palin is viewed favorably by just 22 percent of Americans, according to the poll - including less than half (44 percent) of Republicans. Twenty-one percent of independents and 6 percent of Democrats view her favorably. Twenty-nine percent said they are undecided or not sure how they feel about Palin, including about one in three Republicans and independents. 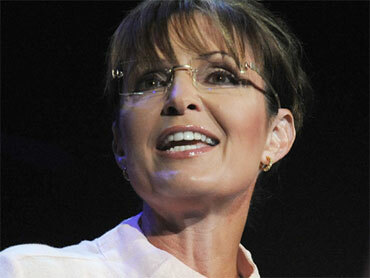 Palin's numbers are far better among Americans who have a favorable view of the Tea Party movement. Sixty-one percent of that group views her favorably, while just 14 percent view her unfavorably. One in four aren't sure. Americans are split when it comes to the Tea Party movement itself. Twenty-two percent hold a favorable view of the movement, while 21 percent hold an unfavorable view. The majority - 56 percent - are undecided or don't know. These numbers have not significantly moved since April. Republicans are most likely to view the Tea Party movement favorably, with 41 percent expressing a favorable outlook. Twenty-three percent of independents view the movement favorably, along with just 4 percent of Democrats. The CBS News poll was conducted between October 1-5, and included a sample of 1,129 adults nationwide. More results from the survey will be released tomorrow. This poll was conducted among a random sample of 1,129 adults nationwide, interviewed by telephone October 1-5, 2010. Phone numbers were dialed from RDD samples of both standard land-lines and cell phones. The error due to sampling for results based on the entire sample could be plus or minus three percentage points. The error for subgroups is higher. This poll release conforms to the Standards of Disclosure of the National Council on Public Polls.